The South African bed sizes naming convention is similar to Australian bed sizes and US bed sizes in that there are queen and king sizes. South Africa also has the three quarter bed size which is widely available (this is similar in size to some of the extra wide singles found in Europe). There is also the extra length single at 92cm x 200cm (3' x 6'7"). There is also the three quarter extra length at 107cm x 200cm (3'6" x 6'7"). 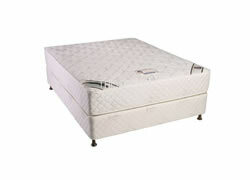 As with all the South African bed sizes there is an extra length double at 137cm x 200cm (4'6" x 6'7"). The extra length queen size bed is 152cm x 200cm (5' x 6'7"). The extra length king size bed is 183cm x 200cm (6' x 6'7").